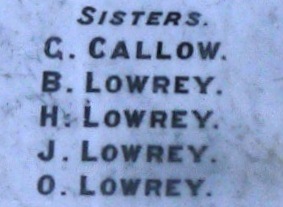 Four girls of the Lowrey family from Stroud responded to the call for military nurses during the First World War. Olivia, Bessie, Violet Hazel and Joyce Lowrey all volunteered for overseas service although Joyce enlisted late in the War and never left Australia. Between them they nursed casualties in England, France, Egypt, India and Australia. The Lowrey sisters were not, as has been sometimes suggested, Australia’s version of Saving Private Ryan. In the 1998 film set during the Second World War a group of US soldiers go behind enemy lines to retrieve a paratrooper whose brothers have been killed in action. None of the four sisters was ever behind enemy lines. This does not mean that nurses were never in physical danger. When travelling at sea there was the danger of torpedo attack – lifeboat drill was a part of the daily routine for staff of hospital ships and troop ships. English towns and cities – where hospitals tended to be situated – were vulnerable to air raids. But only one of the Lowrey sisters was exposed to service close to the front line – this was Olivia Lowrey who joined the Queen Alexandra’s Imperial Military Nursing Service Reserve and served at a British Hospital in Rouen, France. Rouen is a port town north west of Paris on the lower reaches of the River Seine, a little over 100km from the battlefields of the Somme. At times its inhabitants could hear the thunder of faraway artillery.